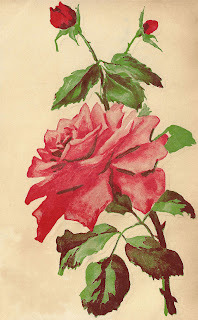 This is a rather distressed pink rose graphic from a vintage postcard. But, I love the distressed look! Actually, it took me a while to fix up this image. The postcard had lots of rips and tears, and the big rose image was heavily damaged. I think it's still a lovely image and cleaned really nicely. I hope you enjoy!